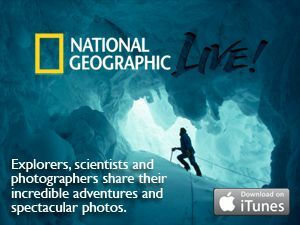 This video was filmed on November 1, 2012 as part of the National Geographic Live! Lecture series at National Geographic Society headquarters in Washington, D.C. In 2004, Cornell University Lab of Ornithology scientist Edwin Scholes and field biologist and National Geographic photographer Tim Laman set out to complete the first comprehensive study of all birds-of-paradise. After 8 years and 18 expeditions they have amassed photographic and video coverage of all 39 known species and documented several new behaviors. Found only in New Guinea and parts of Australia, the birds-of-paradise are a case study in the evolutionary power of sexual selection. Their fantastic plumes and bizarre courtship displays are a result of millions of years of sexual selection at work in an environment with plentiful food and no natural predators. Have students preview several of the videos and choose the one they find most inspiring. Have students describe in writing a conversation they might have with the speaker(s). Freeze the video on a relevant image. Have students observe details in the still image and jot down predictions of what the full video might address. Discuss students’ ideas before and after watching the video. Pose an open-ended question before students watch the video, and have them discuss their ideas before and after in small groups. Have students determine what they think the key message of this video is. Was the speaker effective in getting his or her message across? Show a short clip to engage students during class, and then have students watch the full video at home and write a paragraph responding to the content or a question you give them. Have students note statements that represent facts or opinions, including where it’s difficult to tell the difference. What further research might help distinguish facts vs. opinions? How might the speaker’s viewpoint compare with others’ viewpoints about a topic? family of birds (Paradisaeidae) mostly native to the jungles on the island of New Guinea. study of the biology and behavior of birds.